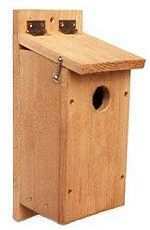 Build the Great-crested Flycatcher birdhouse with cedar, pine, or most any soft wood. Use wood rough-cut on both sides so that birds can grip both interior and exterior surfaces. Make a 6″ by 6″ floor (inside dimensions) and a 9″ floor to ceiling height (inside front). Cut a 1 3/4″ diameter entrance hole located 7″ above the floor (to top of hole). Drill or cut ventilation openings in the floor and under the roof. Attach a hinged roof for easy access to monitor and clean. Or make a fixed roof and Side Opening Doors. Use brass shutter hooks to secure roof in closed position. Always use corrosion resistant screws and hardware. Mount on a tree or post in a secluded area in woodlands between six and ten feet high with partial sun and shade. Place it of reach if it might be disturbed. Woodpeckers and other birds may also use this nest box. Monitor this house. House sparrows like birdhouses with larger entrance holes. Extend the back wall panel beyond both top and bottom. Drill pilot holes in these long panels for mounting. Drill an extra mounting hole inside the box just under the roof.